Massages can be a crucial part of your health regime. Not only does a massage help to relieve aches and tension, but it can also help improve blood circulation. Having professional massages can get expensive, but you will find a lot of handheld massagers and foot massagers in stores that can also help to relieve some of you daily aches and pains. There are a couple of different types so make sure to find one that is the most suitable for you. this is also referred to as a percussion massage since it has a striking or beating stroke on your body. Ideally, this type of massage is used to wake up the nervous system, and to release lymphatic buildup in your back. this is an oscillating motion on your skin. This is probably the most common type of motion seen in a handheld massager. It’s ideal for relaxing muscles, alleviating pain, and stimulating various organs. If you know what types of aches and pains you are trying to reduce, it will help you to know what type of massage modulation you need, and what type of massager to buy. this is a handheld electric massager that usually has more than one speed, and has an adjustable head. It is small and easy to carry, plus it is simple to use. this is a handheld massager that uses specifically placed knobs that are rubbed on your back for muscle stimulation. It is portable, easy to use, and does not require electricity. 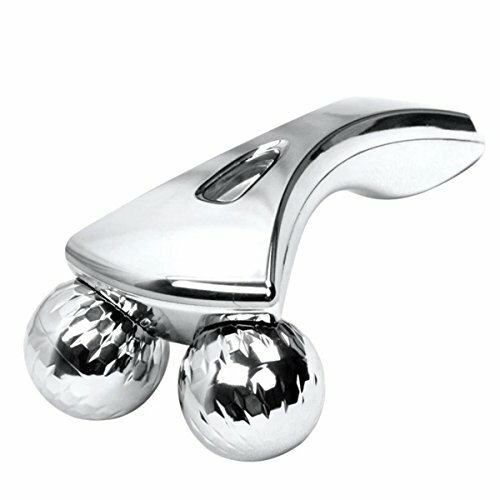 this massager is used to trigger your lower back areas, and is also portable. Before buying a massager, it is helpful to speak with your doctor, and make sure your pain isn’t being caused by another health concerns. Here’s our list of the best handheld back massagers on the market. The Bounce Back Massager is intended for home use on yourself, or on others. It is a great handheld massager for relieving muscle tension, reducing pain in your neck, shoulders, and back, and lessening aches anywhere else on your body. It can be used specifically to reduce the tension on glutes, hamstrings, calf muscles, IT Bands, and quads. The Bounce Back Massager gives you a percussion type of massage that is called a tapotement that is both stimulating and energizing. It is easy to adjust the pressure, and it can also be used to break down trigger points. 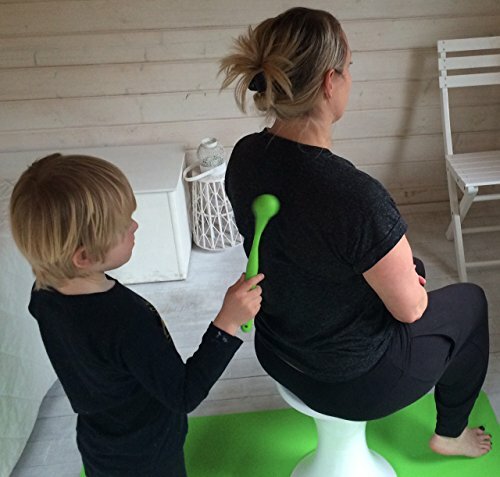 This massager is simple to use, lightweight, portable, hygienic and durable. Plus, it’s perfect for those that do Pilates, yoga, triathlons, cycling, ball sports, swimming, golf, hiking, gardening, and paddle sports. 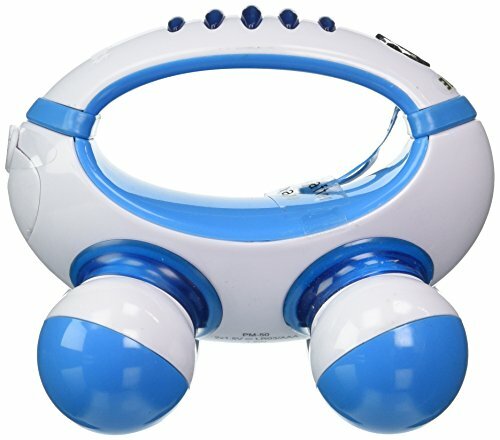 The Bounce Back Massager not only helps reduce muscle tension from too much driving, and working on your computer, but it also helps reduce lactic acid, and prevents sports injuries. 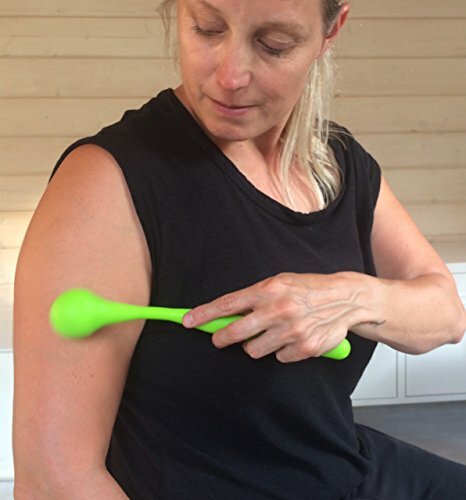 Those that have used the Bounce Back Massager will benefit from the YouTube videos that show you how the massager works, and the Trigger Point Therapy Workbook that helps you locate all the trigger points in your body. The Angel Kiss Therapeutic Massager gives effective relief to muscle tightness and soreness, plus it helps to boost blood circulation while reducing stress, fatigue, and all your body pains. The Angel Kiss is a handheld, percussion massager that has a strong motor that delivers a soothing and comforting massage while running up to 3,350 pulses per minute. It’s easy to target specific areas of your body like your head, necks, back, legs, and feet, plus you can customize your massage with the adjustable speed feature that lets you set the intensity to your own preferences. It also has a dual pivoting head attachment plus heat that lets you choose how much pressure you prefer. This massager comes with an ergonomic handle, and includes four interchangeable attachments for both soft and heated massages. Those that have used the Angel Kiss have had some issues with the massager getting stuck at a certain speed. 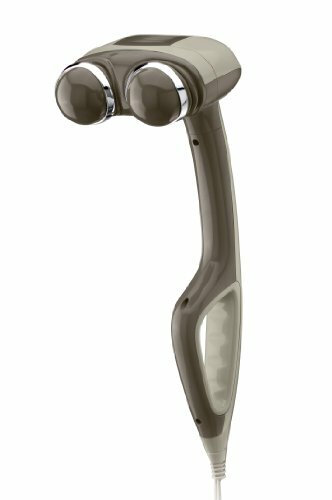 This HoMedics Percussion Action Handheld Massager also has a dual pivoting head, and an ergonomic handle. It provides a percussion action massage that can be used for your entire body. The HoMedics includes custom massage heads that let you change your massage experience from soothing heat to gentle or firm depending on the soothing massage that you need. It comes with variable speed control, and three custom massage attachments. This massager is not recommended for diabetics, and some users have complained that it is heavy and cumbersome. 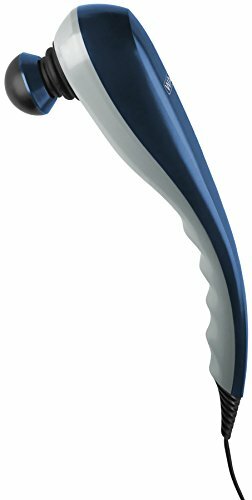 The Wahl Deep Tissue Percussion massager offers muscle relief that can be targeted to specific areas of your body. It has a powerful motor delivering up to 3,350 pulses per minutes, and it comes with four interchangeable heads to customize your pain relief. The Wahl has variable intensity control so you can choose between a light and heavy-duty massage. The Wahl can also help to increase blood flow, and block neurotransmitters while decreasing inflammation, and increasing your oxytocin level. The deep kneading therapeutic massage option allows you to relax and reduce muscle tightness anywhere on your body. The percussion option is the supreme massage selection which spreads healing, and helps with fitness recovery. It comes with four customizable massage attachments heads, and an innovative four finger flex attachments with nodes that duplicate a masseuses hands. The Accupoint attachment head pin points works deep in the tissue that helps break up the knots. The Deep muscle rounded attachment head creates a relaxing massage while the new extra wide flat disc attachment offers vibrations for large areas. 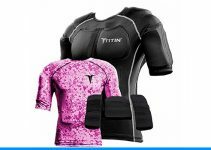 It has an ergonomic design works well on the upper and lower back, arms, legs, and feet. Users of the Wahl have found that you need to be very careful of the parts as they are plastic and will break. The S-Hande Waterproof Wireless Extreme Power Wand Massager helps you relieve shoulder pain, increase blood circulation, reduce fatigue from stress, and relax tense muscles. It has a heating function that will help sooth aching muscles, and has seven vibration frequencies. This cordless, waterproof massager has a whisper quiet motor that lets you relax your entire body, and reduce stress. It has a long lasting battery, and can be recharged with a USB charger. Users have found the only drawback is that you cannot control the intensity of the vibration which is fairly strong. 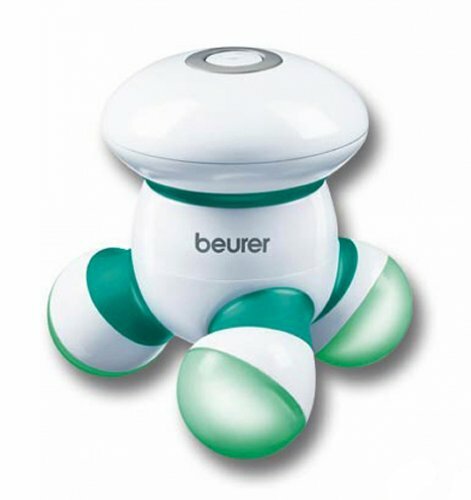 The Beurer MG16 Mini Massager gives you a soft and gentle vibrating massage, and it has an aesthetic LED lighting feature. It’s perfect to use on your neck, arms, back, and legs, and it’s perfect for traveling due to its small and handy size. It comes with a limited lifetime warranty, and batteries are included. Some users have felt that the vibrations are too soft, and that it is really more like a light than a massager. The Pure-Wave CM7 Extreme Power Massager is almost like having the hands of a massage therapist available to you at all times. It is one of the strongest and soothing cordless massagers that you can buy. Lightweight and gentle, the Pure-Wave is still very powerful. It has a variable speed controller so that you can choose how intense you would like your massage, and it includes six different massage heads that lets you customize the style and firmness of your massage. The Pure-Wave will help you work out knots, tight and stiff muscles, cramping legs, and muscle spasms. This massager also includes a facial vibration option for facial and scalp massage. With its dual motor, this cordless massager with an ergonomic design, offers both percussion and vibration options. The Pure-Wave also has an extra-long handle that makes it easy to massage yourself as well as others. Users have commented that the power is weak in comparison to what they have seen in the instructional videos. Therapeutic massages are known to help boost blood circulation to effectively give relief to muscle soreness and tightness while helping to reduce stress, mental fatigue and overall body pains. For anyone that has continual stress, or pain, this is the perfect massager for you. 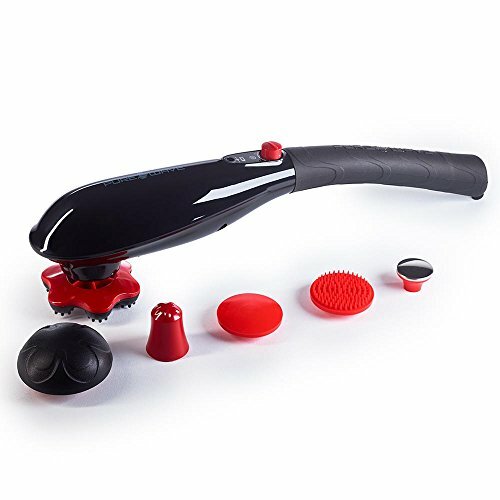 This is a handheld, percussion massager that has a strong motor that can run up to 3,350 pulses in a minute, and provides a comfortable and soothing massage. You can easily target specific areas including your legs, neck, back, head, and feet, plus you can customize your massage with the variable speed feature. The dual pivoting head attachments include a heat option that lets you decide how gentle or firm you want the pressure to be. Users found that it was a good vibrating massager and that the massage bulbs didn’t rotate well. The Homedics PM-50 Hand Held Mini Massager with Hand Grip is battery operated, and ideal for travel. You can literally use it anywhere at any time. It is a fun and functional massager that comes with a comfortable hand grip, so that it is easy and comfortable to use. The Homedics Mini Massager will help you relax your muscles, and give you soothing relief from your daily aches and pains. Users did find that you do have to hold down the “ON” button for it to vibrate, and that it will turn off if you remove your finger. The Passion Wireless Therapeutic Massager Waterproof Wand is ideal for going anywhere that you may go. This cordless, rechargeable massager has a whisper-quiet motor, is waterproof, and includes a USB charger, plus a rechargeable battery. The Passion Wireless Therapeutic Massager is only 7 3/4 inches long, but is just as powerful as a full sized massager. It has a three button control panel that lets you choose your vibration level with one button controlling eight variable speeds, a second controlling eighteen pulsating variable vibrating patterns, and a third that is the on and off switch. It also has relaxing vibrations that help to relieve tension, and lower muscle fatigue that gives your body a deserving recharge. Some users were expecting a wall charger, and were disappointed to find it only comes with a USB charger.